Like seven million other Americans last week, I watched Madoff, the ABC miniseries chronicling the life and financial crimes of the infamous Bernie Madoff. Madoff, chairman of Madoff Investment Securities from its start-up in 1960 until his arrest on December 11, 2008, operated the largest corporate Ponzi scheme and financial fraud in U.S. history. The film, which starred Richard Dreyfuss and Blythe Danner as Madoff and his wife Ruth, aired for four hours over two evenings. The film had the highest viewership of its time-slot, but earned only modest reviews. After the film, ABC aired Madoff: After the Fall, a one-hour documentary hosted by ABC’s chief investigative correspondent, Brian Ross. I gave the whole production two-and-a-half stars; it pretty much held my interest for the duration, the acting was solid, and compared to the usual drivel on prime-time television, it was informative and engaging. 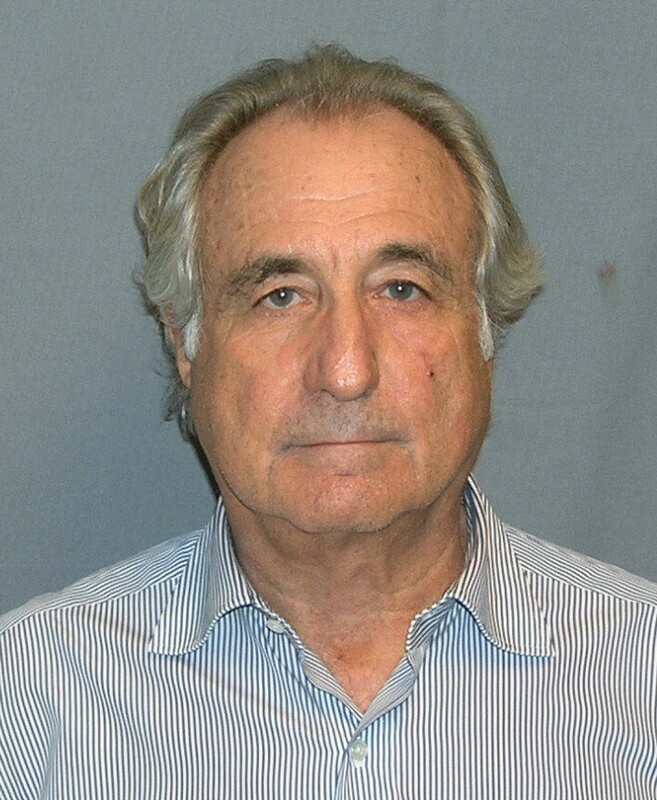 On March 12, 2009, Madoff pleaded guilty to 11 federal felonies, including securities fraud, wire fraud, mail fraud, money laundering, making false statements, perjury, theft from an employee benefit plan, and making false filings with the SEC. He was sentenced to 150 years in prison. In November 2009, David G. Friehling, Madoff’s accounting front-man and auditor, pleaded guilty to securities fraud, investment adviser fraud, making false filings to the SEC, and obstructing the IRS. Friehling fully cooperated with federal prosecutors and testified at the trials of five former Madoff employees, all of whom were convicted and sentenced to between 2½ and 10 years in prison. Friehling could have been sentenced to more than 100 years in prison. Because of his cooperation, however, he was sentenced in May 2015 to one year of home detention and one year of supervised release. Madoff’s right-hand man and financial chief, Frank DiPascali, pleaded guilty to 10 federal charges and, like Friehling, testified for the government at the trial of five former colleagues, all of whom were convicted. DiPascali faced a sentence of up to 125 years, but died of lung cancer before he could be sentenced. Madoff and his associates defrauded their clients over an estimated twenty-year period. Losses were initially estimated at $65 billion. This amount was later significantly revised downward to a range of $10-20 billion. A court-appointed trustee estimated the losses at $18 billion. $7.6 billion of the losses have been recovered, but pending lawsuits only $2.6 is actually available. More recovery is expected. The fallout was tragically not limited to financial losses. On the second anniversary of Madoff’s arrest, his son Mark committed suicide by hanging himself in his Manhattan apartment. Even if one accepts the highest estimate of investor losses at $65 billion, Madoff’s fraud pales in comparison to the $2.7 trillion embezzled from the Social Security Trust Fund by the United States Government. Unlike the Madoff case, it has all but been ignored by the media and government watchdogs and lapdogs. Even the AARP, who pretends to be the greatest friend and protector of our senior citizens, has been silent about the matter. In 1983, anticipating the flood of “baby-boomers” approaching retirement, Congress passed and President Reagan signed into law major Social Security reform legislation. The legislation included a payroll tax hike ostensibly earmarked for the millions of additional baby-boomer recipients. The increased payroll taxes created a $2.7 trillion surplus in the Social Security Trust Fund. Everything was looking rosy for the Social Security Trust Fund. Before the ink was dry on the reform legislation, however, Congress began borrowing money from the Trust Fund to finance current programs and all our undeclared wars, preferring to borrow from the Trust Fund rather than the Chinese. In return, Congress issued IOUs in the form of special Treasury bonds which are physically kept in a binder in a non-descript office building in Parkersburg, West Virginia–the Bureau of Public Debt. (You just can’t make this stuff up.) Unlike most T-bills and other debt instruments, however, the special Social Security bonds are non-negotiable, which means they’re worthless. As one commentator noted, “The IOUs are the equivalent of a bank robber leaving a note in the vault of the amount stolen. The note specifies the amount of money taken, but does nothing to help retrieve the funds.” It’s just a random act of kindness on the part of the perpetrators. By 2010, the surplus was completely looted, embezzled by Congress and the five presidents in office during this time. Beginning in 2010, Congress had to borrow the money from foreign creditors to pay current Social Security benefits. The money is gone and will never be repaid. It’s called embezzlement. Embezzlement is defined as a kind of property theft. It occurs when a defendant, who was entrusted to manage or monitor someone else’s money or property, steals all or part of that money or property for the defendant’s personal gain. The key is that the defendant had legal access to another’s money or property, but not legal ownership of it. Taking the money or property for the defendant’s own gain is stealing; when combined with the fact that this stealing was also a violation of a special position of trust, you have the unique crime of embezzlement. Depending on the amount stolen, embezzlement can be a felony or misdemeanor. It’s safe to say that the embezzlement of $2.7 trillion would be a felony. Unlike the crimes of Bernie Madoff, Countrywide’s Angelo Mozilo, or the Enron Gang, the looting of the Social Security Trust Fund has been met with a deafening chorus of silence. I don’t recall hearing about it on the evening news, there wasn’t a primetime mini-series about it, and it didn’t even merit a segment on 60 Minutes. There have been no interviews of the victims. The media clearly employs a double standard when it come to white-collar crime versus public corruption, and they likewise selectively employ the Mafioso code of omerta. Why? Corporate big business has been the proverbial whipping boy of the chattering and academic classes since the beginning of the Progressive Movement, near the end of the 19th century. Actually, the merchant class has historically been civilization’s bogeyman; it has been held liable for mankind’s every affliction, from prickly heat to global warming. The government’s good intentions trump every tangible life-improving contribution ever made by private inventors and entrepreneurs. But since the intentions of such private innovators are considered self-serving, it matters not. Embezzlement is a crime, be it in the private or public sector. When a CEO of a large firm embezzles his clients, he is given the equivalent of a complete rectal exam by the media and respective government regulatory and law-enforcement agencies. But when an agency or department or branch of the government is accused of similar offences, they are ignored or excused because, after all, the government is our friend and their intentions are ever noble. The mainstream media operates as the de facto Ministry of Information and Propaganda for the U.S. government. Sure, they take sides, in a well-choreographed, stage-managed sort of way. Fox News supports the GOP and so-called conservatives, while the rest of them zealously support the Democrats and so-called liberals. Fox supports the War on Terror and its attending wars and foreign adventures, while the other networks support the War on Poverty and all its failed programs. But none of them ever questions the legitimacy of the State itself, or regularly calls the federal government on the carpet for having acted outside its constitutionally imposed limitations. Taking on Bernie Madoff or Long-Term Capital poses little if any danger to the respective journalist or his employer. Taking on Congress or the Administration is another matter. You may find yourself in the unemployment lines or have your White House creds revoked. The government’s emptying of the Social Security Trust Fund has been accurately called “the greatest fraud ever perpetrated on the American public.” Every president and congressman who supported using the Social Security Trust Fund as a “slush fund” is culpable. Yet, there have been no investigations, no indictments, no arrests. And don’t hold your breath waiting for that 60 Minutes expose or calls for the appointment of a Special Prosecutor to investigate the looting of the Social Security Trust Fund. It ain’t gonna happen and the money will never be paid back. “The Future of SSI: Biggest Government Fraud in History, Future Financial Status of Social Security Program,” Josey Wales, correspondent, Before Its News.